The decision by broadcasters to exclude the Green party from plans for TV debates has led to 1,000 new members joining the party in the past ten days. The spike in sign-ups is part of a longer-term swell in party membership that has seen the Greens grow by two-thirds this year, leading party leader Natalie Bennett to claim next year’s election will be “a genuine five-party fight”. Even before the row over the TV debates, the party had seen a rise in membership, driven partly by its strong performance in May’s European elections, where it came fourth nationally. After hovering between 12,000 and 14,000 since the 2010 election, the Greens now have over 23,000 members. They are not the only ones to see a rise in sign-ups: a Ukip spokesman toldRed Box that this week its membership topped 40,000 for the first time – double the membership of January 2013. Both parties remain dwarfed by Tories and Labour, but they are snapping at the heels of the Lib Dems, whichreported 44,000 members in April. 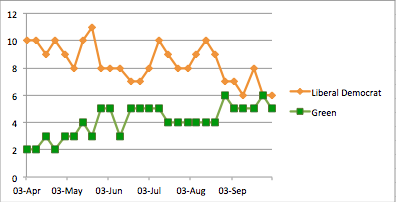 In the polls, too, the Green party has seen a quiet but consistent rise this year. Last week the Greens were placed above the Liberal Democrats for the first time in Lord Ashcroft’s polling, with 8 per cent, although by this week their result had fallen back to 5 per cent. This momentary blip and the excitement it caused obscures another story. Six months ago, the Greens were polling around 2 per cent. This has now more than doubled, to the point where they consistently poll above 5 per cent, and in Lord Ashcroft’s four-week averages, they have edged above 6 per cent. It is this gradual rise that has led YouGov’s Peter Kellner to describe them in theGuardian as “the fourth wild card”. Kellner points out that the Greens are the “mirror image” of Ukip, gaining from younger, left-leaning disaffected former Lib Dem voters in the same way as Nigel Farage’s party has gathered up older, right-leaning disaffected former Tory voters. Together, he added, Ukip and the Greens had the scope to create a “two-headed protest vote”. There are plenty of young, disaffected former Lib Dem voters to go round: ananalysis of polling data by the Times Data Team last month found that around 80 per cent of first-time voters who supported the Lib Dems at the last election would no longer do so. Support for other parties – including the Greens – doubled among this group. YouGov’s polling finds that 50 per cent of new Green voters are former Lib Dem supporters. “Our recent membership surge – we’re gaining a new member every five minutes – indicates that people are clearly liking what little they have had the chance to hear about Green values and policies… increasingly there’s recognition that while Ukip might have been getting lots of attention as apparent political ‘outsiders’ in fact it is the Green Party that represents the voice of genuine democratic change,” said Bennett. The Green party’s successes have spooked the Labour party. Earlier this month Red Box reported that it had given shadow cabinet member Sadiq Khan the task of taking them on. Yesterday, the influential left-wing blogLabourList warned: “We must not make the same mistake with the Greens that we did with the Lib Dems”. 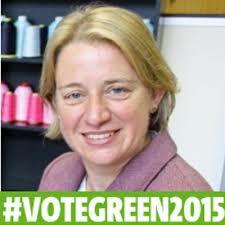 The Green Party has moved ahead of the Liberal Democrats in the latest YouGov polling for the Sun (1). In the latest poll, released late last night, the Greens are in fourth and up two percentage points to 7%. The poll comes hot on the heels of an Ashcroft National Poll (ANP) last week (2), which also put the Greens in fourth and ahead of the junior Coalition partners. The ANP poll marked the first time in a decade that the Greens have out-performed the Lib Dems in a poll ahead of a General Election. The Green Party’s average polling score with pollsters YouGov has risen by three percentage points in the last six months (3). On May 22 2014, the Greens comfortably outperformed the Lib Dems in the European parliament elections both in terms of total vote and MEPs returned (4). The Green Party, the only party offering a genuine alternative to business-as-usual Westminster politics, has challenged (5) the broadcasters’ proposals to exclude the Greens from the planned televised Leaders’ Debates ahead of the 2015 General Election. Almost 200,000 people have signed a Change.org petition (6) calling for the Greens to be invited. Leading political commentators have suggested (7) that polling which puts the Greens ahead of the Lib Dems puts pressure on the broadcasters to invite the Greens in the interest of both democracy and fairness. The polling surge is mirrored by the Green Party of England and Wales’ rapid membership growth in 2014. Commenting on the 2030 climate and energy package agreed today by EU heads of state, Richard Black, director of the Energy and Climate Intelligence Unit (ECIU), said: “The EU deal was probably the best compromise that progressive countries could hope for, given concerns of various nations about coal-burning and competitiveness. “However, it is also a compromise with the climate system and with the needs of future generations. It’s not at all clear that this deal will allow the EU to meet its long-term target of virtually eliminating carbon emissions by mid-century, which science suggests is necessary for limiting global warming to 2 Celsius. About – The Energy and Climate Intelligence Unit is a non-profit organisation supporting informed debate on energy and climate change issues in the UK. Britain faces important choices on energy and on responding to climate change, and they believe it is vital that debates on these issues are underpinned by evidence and set in their proper context. The resurgent Green party is to target a dozen seats across England, which it believes it could either win or come close to seizing in next May’s general election, as membership rises and confidence grows that it could outpoll the Lib Dems. Last week, the number of Green party members in England and Wales passed 22,000 – a 57% increase since 1 January – with the number of young Greens (under-30s) having risen 100% to more than 8,000 since 1 March. Party leader Natalie Bennett told the Observer that the weakness of the Tories, Labour and the Liberal Democrats, and the rise of Ukip, all pointed to the next election being the most difficult to predict of recent times, and one in which the Greens could realistically step in and gain half a dozen seats or more. “I think there is a chance that, in 2015, everything just breaks wide open. With the rise of Ukip, not much more than 25% of the vote could win a seat,” she said. The Greens, who currently hold only one seat, Brighton Pavilion, have been steadily creeping up in the polls over recent months. Most national surveys have put them between 4% and 7%, within touching distance of the Lib Dems, who have been struggling to get back into double figures, despite having won 23% of the vote at the 2010 election. Last week, the party said it would take legal action unless it was included in TV debates, arguing that it received 150,000 more votes than the Lib Dems in the 2014 European elections and won three times as many seats as them. Bennett said that as well as defending Brighton Pavilion, where ex-leader Caroline Lucas is the incumbent, the national party has its eye on another 11 seats in England, and it believes winning around six is not out of the question. “I refuse to predict, but I think there is potential for that range [six seats],” she said. Most Green converts have come from Labour and the Lib Dems, she says. “With the Lib Dems, it is [because of] tuition fees, nuclear power, nuclear weapons and civil rights issues like secret courts. With Labour, it is different. It is that it is still a neo-Thatcherite party and it is still New Labour with the thinnest of rhetorical glosses over the top.” But there also some disappointed Green Tories who, she argues, don’t like fracking and building on the green belt. 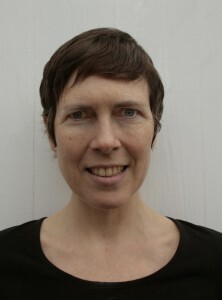 The Greens, she says, will be pushing several policy priorities, including plans to lift the minimum wage to £10 by 2020, the renationalisation of the railways when franchises come up for renewal, greater funding for improved home insulation, and the reversal of creeping privatisation of the NHS. Top of the target list will be Norwich South, currently held by the Lib Dems with a wafer-thin majority over Labour, but where the Greens took 14.9% in 2010. A recent poll by Lord Ashcroft put the Greens on 20% in the constituency. Another possibility is Bristol West, where the Lib Dem incumbent, Stephen Williams, is likely to struggle because of the fall-off in the student vote. Then there is St Ives. “Cornwall is very interesting because there is basically no Labour party there, only Tory and Lib Dem, yet it is a place with incredibly low wages and seasonal casual employment so, in the county elections, we got an average of 18% of the vote,” says Bennett. Others on the target list are Sheffield Central (Labour), Liverpool Riverside (Labour), Oxford East (Labour), Solihull (Lib Dem), Reading East (Tory), York Central (Labour), Holborn and St Pancras (Labour) – where Bennett is standing as the candidate – and Cambridge (Lib Dem). The party in England and Wales will contest 75% of seats in next year’s general election up from 50% last time. 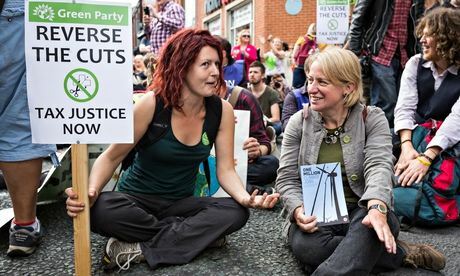 Party leader Natalie Bennett said: “This isn’t a ‘new’ Green Party; our understanding that social and environmental justice are inextricably linked, and our democratic methods of policy and decision-making haven’t changed. The Green Party’s sole representative in the House of Commons currently is former leader Caroline Lucas, who is the MP for Brighton Pavilion. The co-convenor of the party in Scotland, and one of its two MSPs, Patrick Harvie, said “we are determined to maintain the momentum built up during the referendum debate”. You are currently browsing the The Northants Green Party Blog blog archives for October, 2014.